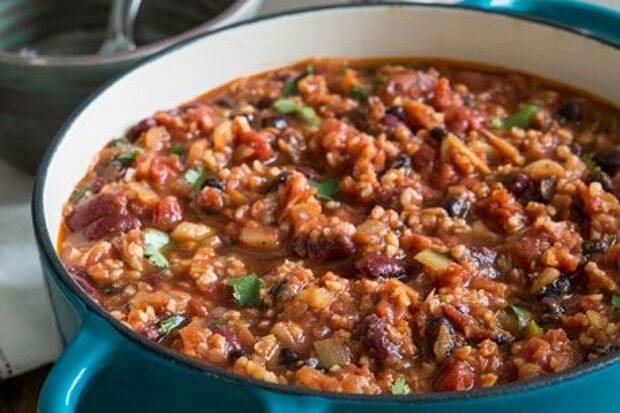 This vegetable chili from Epicurious is amazing on it’s own but if you can’t live without meat, you can always add some to it. Heat the oil in a Dutch oven or large heavy pot over medium-high heat. Add the onion, carrots, and jalapeño and sauté, stirring often, until the onion is soft and translucent, about 5 minutes. Add the bulgur, chili powder, and cumin and stir until well combined. Stir in the tomatoes, tomato sauce, and beans. Bring to a boil, then reduce the heat, cover, and simmer, stirring occasionally, until the beans are tender, about 1 hour. Season with salt to taste. Serve with a sprinkling of cilantro (optional) and enjoy!